Make our community a safer place! You can now submit anonymous tips via text or e-mail to the Austin Police Department. Anyone with a cell phone may send an anonymous tip to Austin Police Department by texting austinpd and their message/tip to 847411 (tip411). Anonymous web tips can also be submitted right from the Police Department’s tab or click here for Submit a Tip and Sign Up For Alerts. The tip411 system is 100% anonymous, as the technology removes all identifying information before police see it and there is no way to identify the sender. 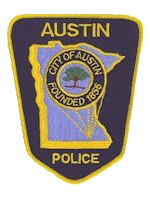 The Austin PD Tips app for iPhone and Android have been published.